Why is my dog a nightmare on lead when he's fine off lead? This is a question that perplexes many dog-owners. Their dog is no trouble when off-lead, but he turns into a snarling hoodlum when on-lead. There are a number of things happening here. Your dog isn’t actually a Jekyll and Hyde, rather he’s able to cope in one situation, but not in the other. Sadly it’s often us who make the situation far, far worse! Although I know that’s the last thing we intend to happen. 1. Off-lead, your dog is able to come across other dogs - maybe even interact with them - without any trouble kicking off. If you watch what’s going on very carefully, you may see that your dog is displaying some excellent social skills. Because he’s not restrained on a lead, his body movement untrammelled, he can display body language appropriate to the occasion. If you video some of these passages or interactions you may see a host of calming signals being employed - perhaps by all the dogs involved. All those things are telling the other dog they’re no threat. When free to move away, your dog may even decide on a nose-sniff and a bum-sniff before moving on. He may not be as “fine” as you think! But it’s when we get into the picture that things can really start to go wrong! 2. On-lead, things can be very different. Because you are used to your dog getting upset when he sees or meets other dogs on the road, you are highly likely to tense up as soon as you see another dog. This lead-tightening tells your dog that you’re worried and that something dangerous is coming. He goes onto full alert and starts to square up to the impending danger. On his toes and ready to defend himself, he’s likely to start barking, bouncing, and lunging at the oncoming dog, in an effort to scare it away. Because the lead is tight, he’s unable to employ any of his natural body language skills and issue calming signals to the other dog. And because these dogs are being forced to walk straight towards each other, with no chance to pause, look away, sniff the ground - or any of those other signals that work so well when left to their own devices - they become helpless to improve the situation. Now, if your dog is unpredictable and just as likely to start trouble off and on-lead, this doesn’t apply to you! This is for those whose dog has had only good interactions with others when off-lead. Acknowledge that your dog can handle things well when you don’t try to influence proceedings. How to stop interfering? Look back at what happens when you see the other dog coming. It’s probably you who tenses up first, winds the lead round your fist, pulls your dog in close, starts barking commands at him. So it’s you that needs to change things. For your dog to change, YOU need to change. If you can ensure that whenever you see a dog coming, the first thing you do is to relax your hands, keep the lead slack, and breathe normally - you may be very surprised at how calmly your dog behaves! 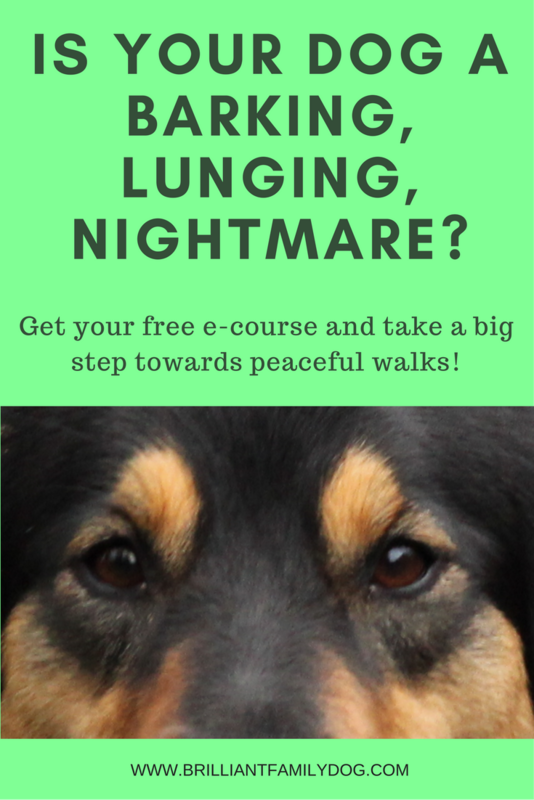 I have often seen a barking and lunging incident snuffed out before it began - simply by the owner relaxing their hands on the lead and not reacting. To begin with, this may take a superhuman effort on your part! It’s hard to change habits we’ve developed - especially if we don’t even know we have them! But if you can rehearse the scene in your mind - perhaps take one which happened to you today or yesterday, and run through it in your mind - you can see exactly where you need to change something you’re doing. Once you’ve cracked this, and you know exactly what to do and when, you’ll develop a new habit. And happily, good habits are also hard to break! Dog Body Language? Whatever is this? Hopefully this has piqued your interest in finding out more about how your dog communicates. I’ll come back with some more on this in a while. For now, become a student of your dog: each little twitch, blink, or sniff means something. And for more learning, get our free Growly Dog e-course here. He’s telling us! It’s up to us to learn how to interpret what he’s saying, with empathy, and without pre-conceptions. Are you paying your dog MORE for what you don’t want him to do?